In a rebuttal to the published video where a Galaxy S6 edge gets bent beyond repair, Samsung has issued a statement complete with a video detailing its own testing procedures. The company claims that the SquareTrade test does not indicate typical usage scenarios and is also not indicative of the phone’s face-down rigidity. In the Samsung video, which opens up with a quick disclaimer, that it’s not inspired by sadistic desires, the complete bend test routine is shown on both the Galaxy S6 and the Galaxy S6 edge. 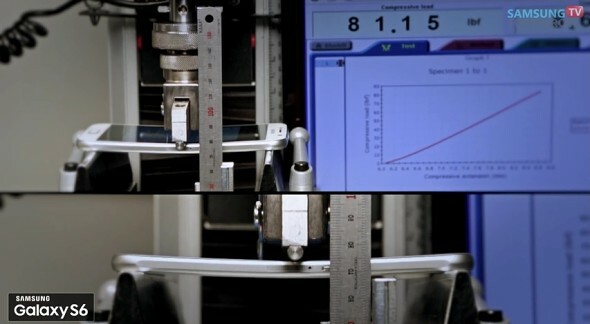 A three point rig is set up with the appropriate software to measure the applied force. In the previous bend test, the Galaxy S6 edge was subjected to a good 110lbf or 149Nm, cracking and becoming unusable. The iPhone 6, the one that started the whole bend craze, died at 179lbf (243Nm). While all this might please the number-crunching crowd, for the general public it means that manufacturers are acknowledging the bending problem, and doing their best to minimize its effect. The thing is. This phone bends in that pressure. Fine, but it gets back to it's form without any damage. That (not getting back to normal) was the problem with the first bendgate issue.